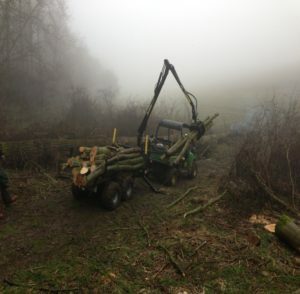 Cut N Clear specialise in motor manual harvesting which helps clients to realise the full potential earnings in areas of forestry previously considered uneconomical due to potentially low yield. Using our low impact Vahva Jussi and Botex trailers, both of which are very low impact on environmentally sensitive sites and brilliant in inaccessible woodland to larger operators, without causing any damage to the standing trees or the forest floor. The thinning of a woodland plantation is essential to improving the quality and development of the remaining trees. With an increasing demand for biomass, chip-wood and pulp, it is possible to finance these operations, by capitalising on the felled timber. We offer a range of options based on our client’s requirements, pro-rata, day rate, fixed price or ‘for timber’.